69 search results for "naegele"
Joshua Boger 73, P06 P09 speaks about Building a 21st Century Pharmaceutical Company during the student-organized Graduate Student Career Retreat March 29. Students pursuing degrees in biology, molecular biology and biochemistry fields had the opportunity to discuss their future careers with Wesleyan alumni during the Graduate Student Career Retreat March 29. 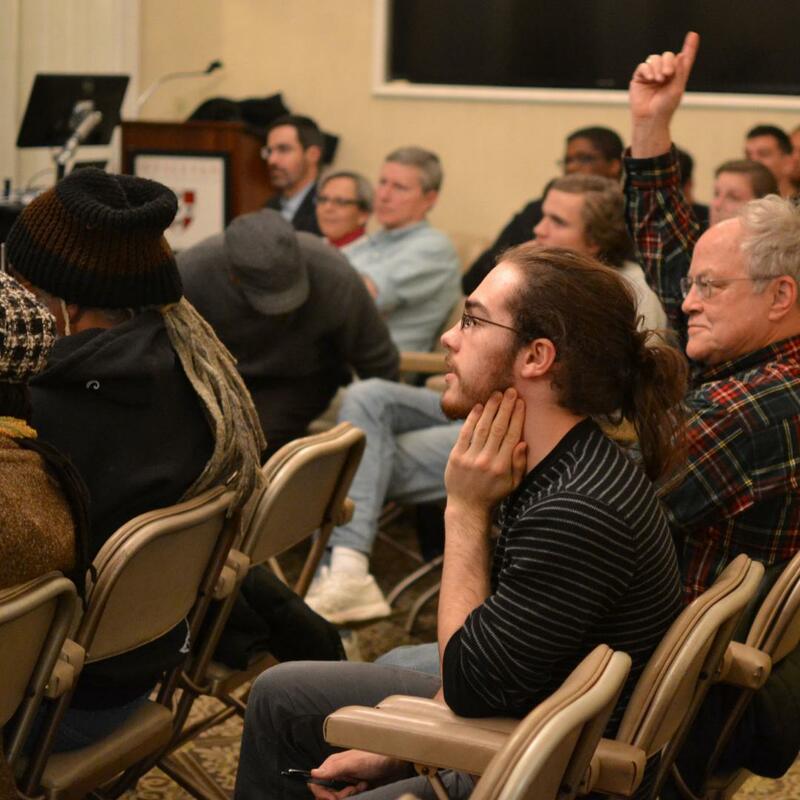 The first-ever event, held at the Wadsworth Mansion in Middletown, allowed alumni to deliver a series of brief talks on their own careers and participate in panel discussions. In addition, graduate students held a poster session to share their own research with the invited guests. 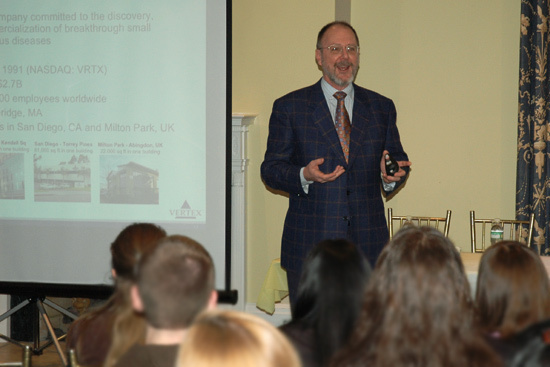 Wesleyan alumnus and trustee Josh Boger 73, P06 P09 was the retreats keynote speaker, and presented Building a 21st Century Pharmaceutical Company and Building Your Future. In the talks, Boger, the founder and CEO of biotechnology company Vertex Pharmaceuticals in Cambridge, Mass. discussed his companys current research on developing an antiviral drug for Hepatitis C and increasing lung function in cystic fibrosis patients. Boger urged graduate students take chances to tackle the unknown and stay true to their personal values. An additional 19 guests spoke on science-related careers in one of three sessions: academia, industry and alternative careers. Many of these speakers were Wesleyan alumni. Jacek Majewski Ph.D 99, assistant professor of human genetics at McGill University and the Genome Quebec Innovation Centre in Montreal, Canada, currently studies pre-mRNA processing among individuals and tissues. Fifteen years prior, Majewski was pursuing a completely different career path. No two alumni had similar career paths or current positions. Kristen Martins-Taylor, who received a Ph.D in molecular biology and biochemistry in 2007, is a postdoctoral fellow at the University of Connecticut Health Center, where she studies embryonic stem cells. Judy Dunn, who received a Ph.D in biology in 1997, is a medical director at researched-based pharmaceutical company Sepracor in Marlborough, Mass., where she provides scientific input for therapeutic product development. Roopashree Narasimhaiah, who earned a Ph.D in biology in 2005, is an assistant director of development, corporate and foundation relations at Yale University and works as a liaison between the Yale School of Medicine and several corporations. Stephen Saxe, who earned his Ph.D in molecular biology and biochemistry in 1985, spoke on alternative careers in the science. After working for the National Institutes of Health and teaching pharmacy classes as an assistant professor at Albany College, Saxe went on to obtain a law degree and now serves as associate general counsel in intellectual property at Alexion Pharmaceuticals in Cheshire, Conn. The event was funded by the Joseph and Matilda Melnick Research and Endowment Fund and organized by graduate students Noelle Ammon and Tina Motwani. 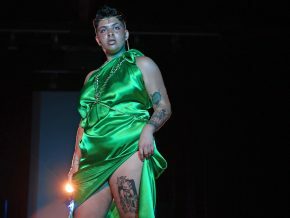 Several other graduate students, faculty and staff helped plan and create the event. About 70 students, faculty, alumni and guests attended the retreat. 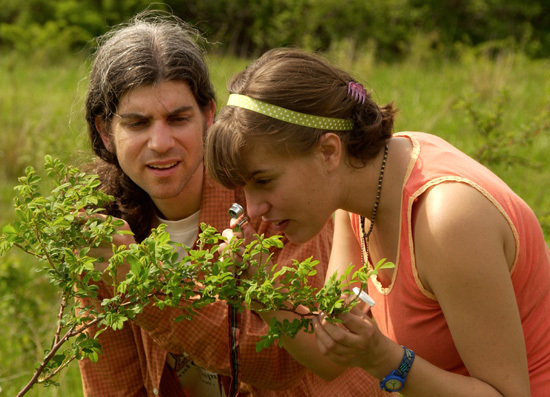 Michael Singer, assistant professor of biology, is the recipient of a NSF grant which will enable him to hire a postdoc and undergraduate student to collaboratively research behavior of the woolly bear caterpillar. When a woolly bear caterpillar becomes infected with a parasite, it cant go to a pharmacy for medicine, so it does the next best thing: It eats the leaves of medicinal plants. The two-year, $314,267 grant will permit Singer to study in more detail this prescient behavior by the woolly bear caterpillars, also known as Grammia geneura. The grant allows Singer to continue a study he initiated a few years ago, the results of which were published in the July 27, 2005 issue of the esteemed scientific journal Nature. Singers study will include distinct segments. It will begin with behavioral experiments that will characterize the dietary choices of experimentally parasitized caterpillars in relation to caterpillars without parasites. Then experimentally parasitized caterpillars will be given different diets to evaluate the role of specific diets in resistance against parasites. Physiological experiments will evaluate the effects of these diets on the caterpillars immune response to parasites. In addition, to analyze the direct effects of caterpillar diet without the immune system, the parasites will be grown in artificial diets that reflect different caterpillar diets. Theory predicts that caterpillars employ two distinct mechanisms of self-medication that vary in their severity of negative side effects. We hope to generate some definitive findings by the end of the study, Singer says. The grant comes at a time when grant funding by the NSF has become extremely competitive and difficult to obtain. Along with funding Singers research, the grant will also pay for a post-doctoral research fellow. In addition, there is funding to hire an undergraduate research assistant during each summer. Jenna Gopilan ’07 researches neural stem cells in mice brains, and presented her research at a recent StemCONN conference. Jenna Gopilan 07 familiarized herself with the scientific research environment during her freshman year as a work study student. 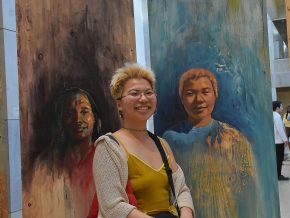 As a sophomore, she shadowed graduate students to learn their techniques. Now, as a senior, the neuroscience and behavior major had the opportunity to present her own research project to the Media and Legislative Briefing at the State Capitol in Hartford. The briefing took place during Connecticut’s Stem Cell Research International Symposium, also known as StemCONN 07, March 27-28. Gopilans research, presented on a poster, was titled Defects in the Neural Stem Cell Niche in Adult Mice Deficient for DNA Double-Strand Break Repair. Political leaders, scientists, academics and the general public attended the symposium. Gopilian was the only undergraduate chosen from 10 other students to present for this session. Launched in the wake of Connecticuts historic decision to support human stem cell research, StemCONN attracted stem cell researchers from around the world. The program included events touching all aspects of stem cell research, including scientific, commercial, political and ethical dimensions. Connecticuts Governor Jodi Rell opened the proceedings. 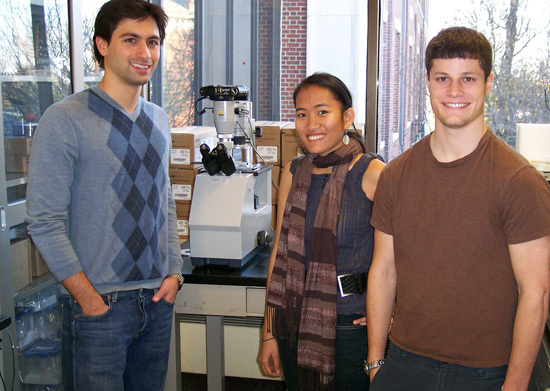 Gopilan received funding for her project from Connecticut United for Research Excellence (CURE) and Connecticut Business & Industry Association (CBIA). 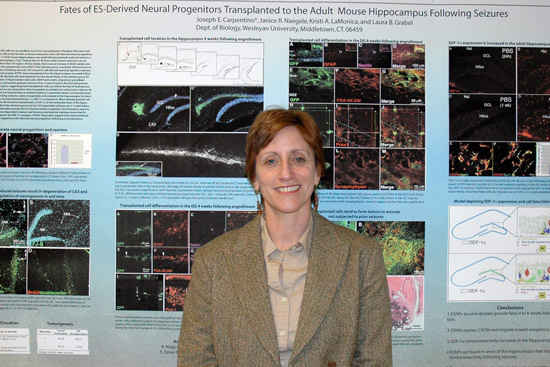 The grant funds her studies of endogenous neural stem cells in the hippocampus of adult mice and the neurogenic response of the brain to seizures. Last summer, Gopilan conducted research at the University of California, San Francisco. There, she learned how to harvest neural stem cells from the central nervous system of adult mice. 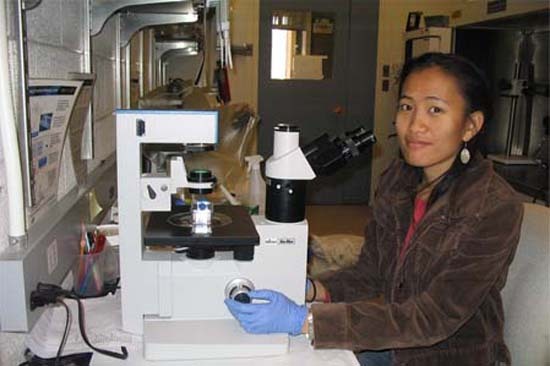 She was able to use the technique back at Wesleyan in the lab supervised by Janice Naegele, professor of biology and chair of the Biology Department. Prior to her junior year, Gopilan was accepted to be a Hughes Fellow, spending the entire summer working on a single research project The Effects of Serotonin on Adult Neurogenesis in the Dentate Gyrus of DNA-PKcs Mice. Gopilan will graduate this May, but will continue her research as a fifth-year master’s student at Wesleyan. After Gopilan offered her presentation side-by-side with scientists who have received major grants from the state, Dr. Gerald Fishbone and Dr. Jerry Yang, members of the Connecticut Stem Cell Research Advisory Committee, lauded her work and offered advice for the young scientist. The long-term goal of her work is to repair brain damage in disorders such as epilepsy. Matthew Donne ’07, Jenna Gopilan ’07 and Dan Austin ’08 received fellowships based on academic achievement and enthusiasm for laboratory science. 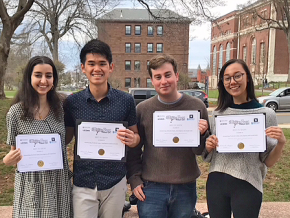 Three Wesleyan students received research bioscience fellowships from the Connecticut Business & Industry Association (CBIA) and the Connecticut United for Research Excellence (CURE). The fellowships are designed to increase the number of qualified scientists interested in pursuing careers in the biosciences. Molecular biology and biochemistry major Dan Austin ’08; neuroscience and behavior major Jenna Gopilan ’07; and biology major Matthew Donne ’07 each received the $5,000 fellowship. The students were selected on the basis of academic achievement, enthusiasm for laboratory science and interest in pursuing a career in the pharmaceutical, biotechnology, or biomedical manufacturing industry. Austin and Gopilan work under the direction of Jan Naegele, chair of the Biology Department, professor of biology and professor of neuroscience and behavior. Donne works under the direction of Laura Grabel, the Fisk Professor of Natural Science and professor of biology. the vulnerability of hippocampal neurons injured by seizures. One type of hippocampal neuron that produces STEP is thought to act as the “brakes” to prevent excessive excitation and seizures. These STEP-containing neurons are among the earliest cells to die in seizures, and preventing their death might be a way to limit seizure activity. He will use cultures made from the hippocampus of STEP knockout mice or wildtype mice to study whether STEP-deficient neurons survive excitotoxic damage better than neurons containing STEP. Gopilan will use an epilepsy model in mice to study how neural stem cells respond to damage caused by epileptic seizures. Previous work in the Naegele laboratory showed that seizures produce a strong increase in the production of new neurons in the adult brain, from populations of neural stem cells located in the hippocampus. The mice she studies lack a DNA repair protein that may be critical for maintaining neural stem cell populations in the brain. This research study will help her understand how DNA repair, serotonin and seizures interact to regulate stem cells. Gopilan will extract neural stem cells from the hippocampus after seizures and grow them in tissue culture to define serotonin’s effect on the birth and growth of hippocampal neurons. “This project will be beneficial in recognizing the different factors involved in repairing the brains of patients with temporal lobe epilepsy,” Gopilan explains. Donne, of Litchfield, Conn., hopes to use his fellowship to characterize the extraembryonic cell types present in human embryonic stem cell embryoid bodies and to generate outgrowth cultures on different extracellular matrix substrates that reflect in vivo conditions. To determine the cell types present, Donne will be using immunohistochemistry and specific cell type markers. Such research in the future can be applied to determining the specific genetic basis for miscarriages and other early fetal or placenta relationships, Donne says. Austin, Gopilan and Donne are three of 10 students from Wesleyan, the University of Connecticut and the University of New Haven, to receive the fellowships. 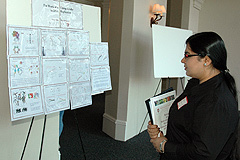 Results of their research will be presented at StemCONN 07, Connecticuts Stem Cell Research International Symposium, to be held at the State Capitol on March 27, 2007. The fellowship program is made possible through a U.S. Department of Labor H-1B grant being administered by CBIA. The CBIA is Connecticuts largest business organization with 10,000 members. CURE is a statewide coalition of over 100 educational and research institutions, biotechnology and pharmaceutical companies and other supporting businesses. Both organizations are dedicated to promoting the growth of research and science in Connecticut. “This fellowship program helps Connecticut continue to have the highly educated workforce needed to remain competitive in bioscience, while keeping the brightest students in the state,” says Judith Resnick, CBIA director of workforce development and training, and the deputy director of the association’s Education Foundation. Laura Grabel, the Fisk Professor of Natural Sciences and professor of biology, received $878,348 for her study on embryonic stem cells. Wesleyan and one of its researchers were major beneficiaries of the State of Connecticuts initial round of nearly $20 million in grants to fund non-federally-sanctioned stem cell research. The awarding of the grants was announced on November 22 in Hartford. 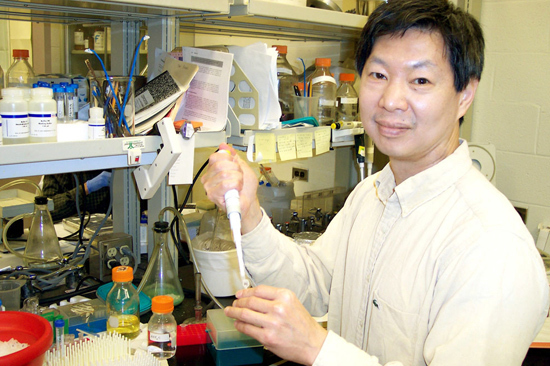 Grabel will also be co-director of the Human Embryonic Stem Cell Core Facility with Ren-He Xu, associate professor and director of the human embryonic stem cell laboratory at the University of Connecticut Health Center. The stipulation regarding unapproved stem cell lines is extremely important to stem cell researchers because of the federal guidelines. It is not illegal to work with these non-approved stem cell lines; in fact, researchers in private industry have been doing so for several years. However, researchers cannot use facilities or resources that have been paid for by federal funds for approved stem cell lines in conjunction with research on non-approved lines. A similar facility will also be created at Yale with an identical $2.5 million state grant. Grabel adds that use of these facilities will not be limited to the three universities who are being funded by the states stem cell initiative  Wesleyan, Yale and UConn. Grabels work at the facility will be based on the individual grant she received from the state. Her research focuses on how to improve the effect of stem cells can be implanted in the brain to replace damaged neurons. When Grabel says we she is referring to her co-investigators, Janice Naegele, chair and professor of biology, professor of neuroscience, and Gloster Aaron, assistant professor of biology. Parts of the Human Embryonic Stem Cell Core Facility in Farmington are already up and running. The rest should be fully operational in early 2007. By David Pesci, director of Media Relations. Gloster Aaron, Janice Naegele and Laura Grabel will study if stem cell-based treatment in mice brains could possibly control epileptic seizures in human brains. A $300,000 grant from the McKnight Foundation will help a Wesleyan University researcher investigate the possibility of using brain transplants of embryonic stem (ES) cells to control epileptic seizures in mice. If successful the study could lay the early groundwork for using similar therapy in human beings. Janice Naegele, chair and professor of biology and professor of neuroscience and behavior at Wesleyan, is the principle investigator in the study that will bring together the expertise two other Wesleyan faculty  Laura Grabel, Fisk Professor of Natural Science, professor of biology, and Gloster Aaron, assistant professor of biology  as well as Gordon Fishell, professor of biology at New York University. During the three-year study, Naegele and her colleagues will attempt to create GABAergic neurons from mouse ES cells and implant them in the brains of mice that experience epileptic seizures. The hope is that the new neurons derived from the grafted ES cells will be able to restore normal levels of the brains inhibitory neurotransmitter GABA by replacing GABAergic neurons destroyed by the epileptic seizures. GABA is one of the key chemical messengers in the brain that regulates the firing of neurons and prevents seizures. From a clinical perspective, animal epilepsy isnt identical in all facets to human epilepsy. However, it is close enough that Naegeles successful use of these GABAergic neurons to control seizures will go a long way to help scientists understand the potential treatment implications in humans. For the study, the researchers will chemically induce the initial epileptic seizures in the mice. After two to three weeks, the mice develop spontaneous seizures, making the overall effect more similar to the way seizures occur in humans. The stem cell grafts will be made into the brains of transgenic mice that have fluorescent neurons, allowing the scientists to identify interactions between the cells in the grafts and the host brains using a combination of electrical recording and microscopic imaging. The studies will attempt to demonstrate that the grafted stem cells form connections with the host brain, a critical step for functional recovery from epilepsy. To create the cells needed to potentially suppress the seizures, Naegeles team will use a new method to produce high yield GABAergic neurons. 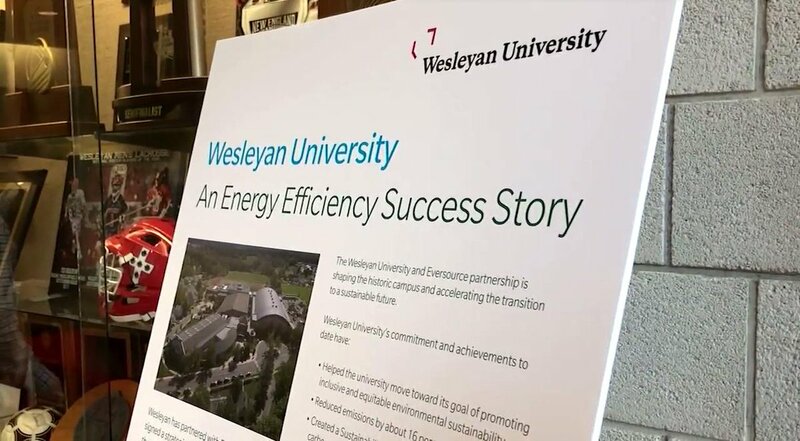 Along with the faculty mentioned, this three-year study will also involve post-doctoral students, graduate, and undergraduate students at Wesleyan who will be assisting with components of the research. In addition to supporting this collaboration, Naegele will participate in a yearly McKnight Conference on Neuroscience, which fosters interactions among the awardees of all of their programs. This years conference will be held in the June 2007 in Aspen, Colorado and will focus on music, art, and the brain. According to their Web site, The McKnight Endowment Fund for Neuroscience is an independent charitable organization established by The McKnight Foundation to carry out the wishes of its founder, William L. McKnight (1887-1979), who led the 3M company for three decades. McKnight had a personal interest in memory and its diseases. He chose to set aside part of his legacy to bring hope to those suffering from brain injury or disease and cognitive impairment. The Neuroscience of Brain Disorders Awards were established in 2000 as the Memory and Brain Disorders Awards. Each year, up to six awards are given. Awards provide $100,000 per year for three years. For more information go to www.mcknight.org/neuroscience. Pictured left to right, front row: Gloster Aaron, assistant professor of biology; John Seamon, professor of psychology; Janice Naegele, associate professor of biology; John Dekker, candidate, department of neurobiology, Harvard Medical School; Megan Carey, postdoctoral fellow, neurobiology department, Harvard Medical School; Allan Berlind, professor of biology, emeritus; Joshua Gooley, postdoctoral fellow, Division of Sleep Medicine, Brigham and Women’s Hospital; David Bodznick, professor of biology; Harry Sinnamon, professor of psychology; John Kirn, chair, neuroscience and behavior program and associate professor, biology; Back row: Sam Sober, postdoctoral fellow, Keck Center for Integrative Neuroscience, UCSF and Mauricio Delgado, assistant professor, department of psychology, Rutgers University. 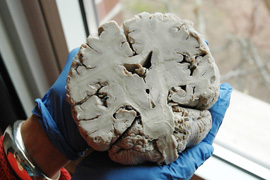 The Neuroscience and Behavior Symposium was held at Wesleyan University on Feb. 11. Organized by John Kirn, associate professor of biology, neuroscience and behavior (NS&B) and Chair of Wesleyans Neuroscience & Behavior Program, the symposium was designed to allow current Wesleyan undergraduates to discuss the major and research with established alumni of the Neuroscience & Behavior Department. Nearly 60 people attended the symposium, which was followed by lunch and an informal panel discussion. I think that current students like to hear first hand about the experiences of others who are a few steps further along in their career paths, says Kirn, who hoped to also attract to the symposium Wesleyan students who dont conduct research, and who have limited interactions with graduate students. All of our current majors doing research interact with our own graduate students and I think this is a very important mentoring process – yet another reason why we are lucky to have a Ph.D. program, he says. Kirn also says the conference was a great opportunity for current students to learn how the speakers structured their own educations at Wesleyan and to find out what their lives are like now. Current Wesleyan students, like Emily Gallivan and Jessica Ghofrani, both Sophomore NS&B majors, were happy with the small, intimate symposium setting and found the presentations interesting. Junior NS&B major Tarek Sami agrees. I liked hearing about the history of the department and this was a great opportunity to meet alumni and current faculty in the department, he says. Careys work suggests a mechanism for how sensory signals represented in specific brain areas can lead to changes in neuronal activities that trigger learned behaviors, such as riding a bike or playing tennis. Carey studied the repeated eye movements of monkeys in order to gather her information. Sober, who also received his Ph.D. from UCSF, is now a postdoctoral fellow at UCSFs Keck Center for Integrative Neuroscience. He spoke about his Ph.D., which involved analyzing the movements that human subjects made when reaching towards targets in a virtual reality environment. Sober used virtual reality to alter visual imagery, by shifting an image of the subjects arm away from its true location. Sober says that although his studies focused on healthy individuals, a basic understanding of how the brain integrates different sources of information could help us understand disorders resulting from strokes and traumatic brain injuries. Sober, who earned a Luce Fellowship, took a year off after graduating from Wesleyan to study acupuncture in Korea. He told the audience that taking a year off between finishing undergraduate studies and beginning graduatestudies or medical school was a good way to stem potential burn out. Other presentations included Entrainment of the Circadian Timing System, by Joshua Gooley 00; Reward-related processing in the human striatum, by Mauricio Delgado 97 and Single Channel Analysis of Mammalian HCN Gating, by John Dekker 98, 99. 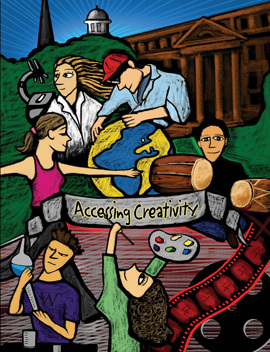 Accessing creativity will be the topic of discussion during the fourth annual Shasha Seminar for Human Concerns Oct. 6-8 at Wesleyan. 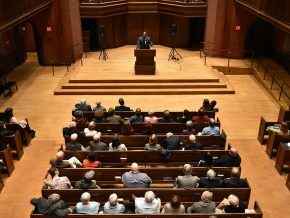 Through a series of seminars and hands-on workshops, alumni, parents and friends will expand their understanding of the creative process and its impact on human endeavors. Attendees also can take workshops in Javanese Gamelan, African drumming, drawing, writing, and behavioral study of human speech and birdsong. The interaction among participants is always spirited and rich with ideas, Secord says. Howard Gardner P ’91, P ’98, the John H. and Elisabeth A. Hobbs Professor of Cognition and Education at Harvard University is this years keynote speaker. Abraham Adzenyah, M.A. ’79, adjunct professor of music at Wesleyan; Ramon Alos Sanchez, a graduate student in film direction at the Centro Sperimentale di Cinematografia in Rome, Italy; Julie Burstein ’80, executive producer of Studio 360 at WNYC Radio in New York; John Frazer, professor of art, emeritus at Wesleyan; Anne Greene, adjunct professor of English at Wesleyan, director of Writing Programs, and director of the Wesleyan Writers Conference. Also John Kirn, associate professor of biology and associate professor of neuroscience and behavior and chair of the Neuroscience and Behavior Program at Wesleyan; Liz Lerman, founding artistic director of Liz Lerman Dance Exchange; Ricardo Morris, director of the Green Street Arts Center; Janice Naegele, associate professor of biology, and associate professor of neuroscience and behavior at Wesleyan; John Paoletti, the William R. Kenan Professor of the Humanities, professor of art history, and director of the new museum project at Wesleyan. Also Nick Rabkin P08, executive director of the Center for Arts Policy at Columbia College Chicago; Alan Robinson, a faculty member at Isenberg School of Management at the University of Massachusetts, Amherst and Sumarsam, M.A. ’76, chair and adjunct professor of music at Wesleyan. Endowed by James Shasha ’50, the Shasha Seminar supports lifelong learning and encourages participants to expand their knowledge and perspectives on significant issues. The cost is $250 per person. 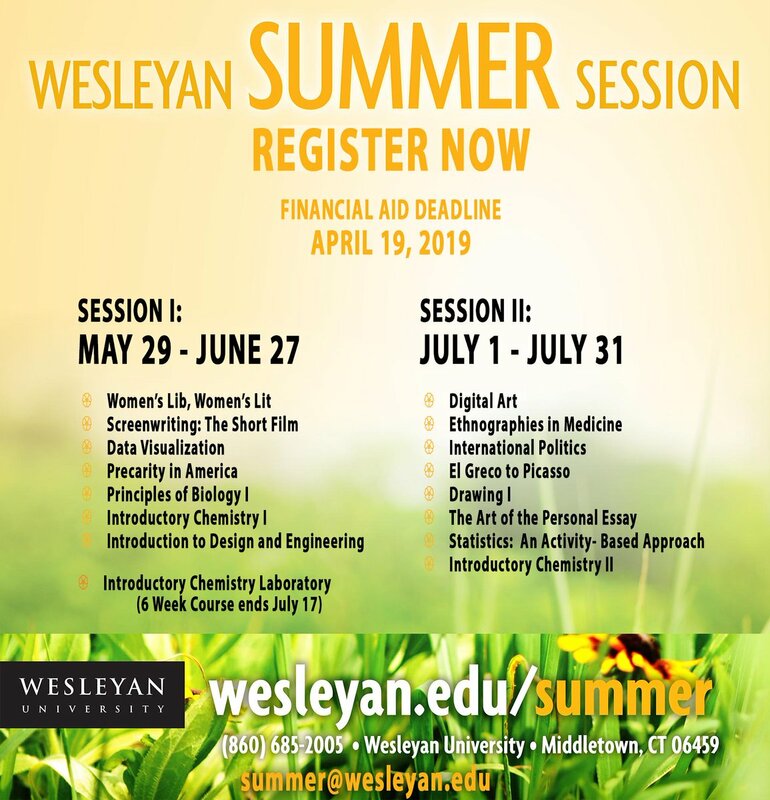 For more information or to register, contact Kathy Macko at kmacko@wesleyan.edu or 860-685-2737. The Shasha Seminar Web site is: http://www.wesleyan.edu/shasha. Biology visiting assistant professor Stanley Lin researches ways to prevent brain cell death in stroke patients. Q: Professor Lin, youre among only a handful of scientists, nationwide, studying excitotoxic cell death. Please explain your research, and what this means for stroke victims. A: After a stroke, millions of brain cells can get over excited and the cells can die. This cell death is an ongoing process. This condition can be prevented if the neurological signaling pathways that that cause cell death are inhibited. If we use proteins that block excitotoxic pathways, we could prevent post-stroke death. A: An excitoxin, is an excited poison. It is a normal neurotransmitter that damages neurons when released in large amounts. An excitoxin binds to certain nerve cell receptors, stimulates the cell, and either damages the cell or results in neuronal cell death. Excitatory amino acids, can produce lesions in the central nervous system and set off progressive diseases such as. Its also a factor in nerve damage in patients who have epilepsy or asphyxiation. Q: In addition to strokes, what types of medical problems can arise from cell death? A: Excitotoxic cell death is thought to be a central and underlying cause of brain damage in a variety of neurodegenerative disorders such as Huntingtons, Parkinsons, or Alzheimers disease. An understanding of what causes cell death and lesions after strokes will lead to prevention of the paralyzing cell loss. 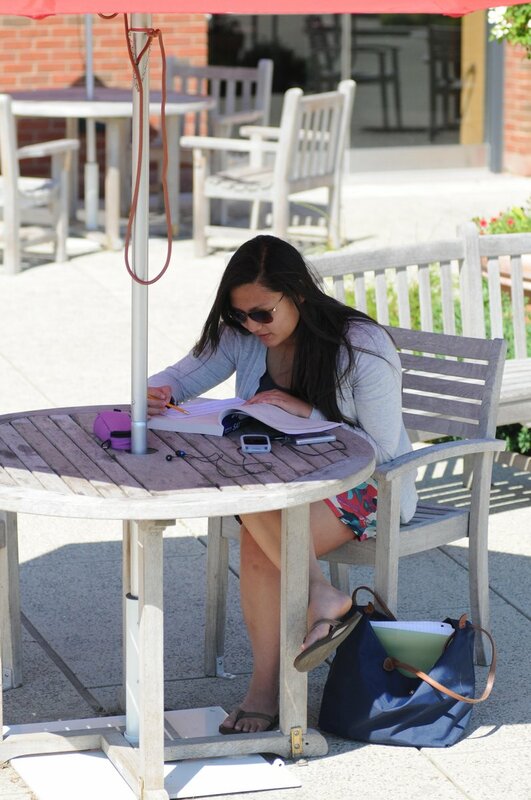 Q: Where did you study this subject before coming to Wesleyan? A: I earned my bachelors and doctorate from Johns Hopkins University. Most recently Ive collaborated with professors at Yale University on this subject. Prior to coming aboard at Wesleyan in 2002, I worked in both the oncology and neuroscience fields, studying serotonin-associated signaling pathways, cloning novel signaling molecules from the brain, and studying the mechanism by which salmonella can target tumors and slow tumor growth. Q: What are some of your recent publication topics? Q: Do you collaborate with any of the other professors? 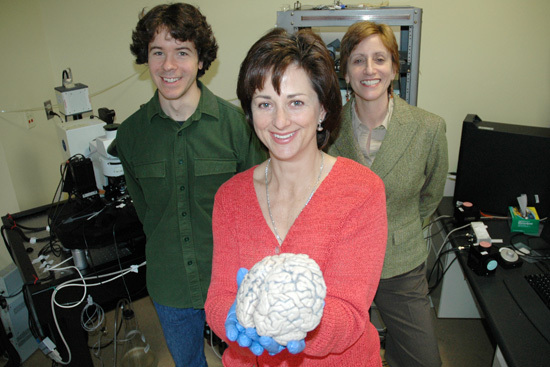 A: I perform research with Janice Naegele who is an associate professor in biology and neuroscience and behavior. She investigates the role of DNA repair in neuroprotection. Shes more anatomical, and Im more molecular, so our work complements each others. We, and student Jia Liu, study cell cultures and segments of rodent brain. Under a microscope, we study the activity of a specific molecule, technically called striatal-enriched tyrosine phosphatase, or STEP, a brain-specific molecule that turns off cell death pathways. During nerve death, the STEP molecule gets degraded, and is no longer present to prevent cell death. Q: Please explain more about these STEP molecules. A: The STEP proteins, both normal and mutated, are fused to amino acids that allow the STEP proteins to enter cells, bind to enzymes in the cell death pathway, and block death-associated signaling. So far, weve shown that addition of certain STEP mutants, but not others, can block excitatory cell death. I plan to study the differences in action of the individual STEP mutants in order to identify the critical cellular reactions involved in cell death. Q: What classes do you teach here and what do you want students to get out of your classes? A: Last fall, I taught neuropharmacology and this spring, Im teaching a molecular and cellular neurobiology laboratory course. I want students to get a fundamental understanding of how cells work in the brain, the anatomy of the brain, and hope they can visualize paths in the brain. Q: How do you study the brain? A: We study them directly. Along with graduate students Jia Liu and Mohit Neema, we bring out a mini bologna slicer and will slice apart mice brains for students to study under the scope. Q: Do you enjoy research or teaching more? A: Ive always done research, but Im enjoying teaching, too. Research keeps me mentally active, whereas the students can really keep you on your toes. Those students who really get into neurology are the most rewarding to teach. Q: I understand working here has some sentimental value to you. A: Yes. My father, Po Chen Lin, earned his masters degree in English literature from Wesleyan in 1948 under Professor Fred Millett. Q: What do you do after a long day in the lab? A: I studied violin at the Peabody Conservatory at Johns Hopkins, so I like to meet up with my trio. We call ourselves Youth n Asia. We have performed at various local venues, including Connecticut Hospice and the Neighborhood Music School. I also enjoy reading and spending time with my daughters, Shau-Ru a recent graduate of Smith College, and Fu-Fu.